Imagine what it's like to be a nurse leader. (Actually, many of you reading this don't have to imagine!) You're caring for patients - a tough job in and of itself - and you're expected to keep doing that and manage a staff of others like you. In many organizations, nurse leaders get only a classroom course and a one- or two-week training period to help them make the transition. The Nurse Leader Handbook: The Art and Science of Nurse Leadership helps "fill in the knowledge gaps" for the courageous and dedicated men and women who take on one of the most complex jobs in healthcare. Ultimately, being a great nurse leader is all about making the staff's job easier so that they can provide exceptional patient care. That's what all nurses at all levels care about most - and it's a truth that's interwoven throughout this informative and inspiring book. 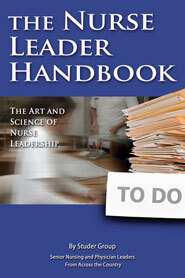 The Nurse Leader Handbook is an anthology whose chapters are written by a variety of Studer Group coaches, nurse leaders and physician leaders from across America.